-- Select a Size -- X-Small Small Medium - Out of Stock! Large - Out of Stock! X-Large - Out of Stock! For the dog that loves to lead, our Ultimate Control Harness by Canine Equipment has two connection points to offer three levels of control. Front leash attachment redirects your dog’s attention when it tries to pull. 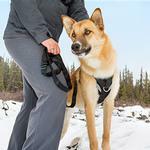 The rear leash attachment connects to a martingale function to gently squeeze your pet's body when they try to pull. Breathable mesh panels and lining provide comfort and air circulation. Reflective signature Canine Equipment label and piping keeps your pet visible at night. Heavy duty materials and reinforced stitching ensure the product durability. 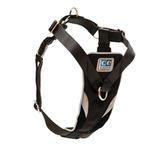 Ultimate Control Dog Harness by Canine Equipment - Black Customer Photos - Send us your photo! very hard to find a perfect fitting harness for her but this one fits perfect,at 90 lbs looks like it was made for her,love it. Posted On 07/30/18 by Amy K from southern California, CA Yes, Amy K recommends this product! This harness is delightful, because it fits the broad chest of my new foster dog, Aubrey, and includes a leash attachment ring on the front of the harness. When a leash is connected to the harness' front attachment ring during walks, a pulling dog turn will toward you somewhat, as opposed to dragging you down the street. When combined with treats (i.e., rewards for giving attention, eye contact, and walking by your side), this harness is a wonderful tool for teaching loose leash walking. The harness also seems to be well made, with high quality construction and design. Aubrey weighs about 50 pounds (chest 26 inches; neck 19 inches; back length 22 inches) and wears a size large in the harness, though with its adjustment capabilities, most likely it would fit larger pups as well. Separately, I will share a “customer photo” of her looking adorable in her new harness. 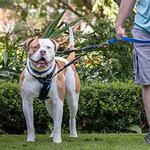 Thank you, BaxterBoo, for carrying such a helpful training harness that fits larger, broad-chested pups. Posted On 11/20/17 by Adrian P from Chattanooga , TN Yes, Adrian P recommends this product! Our 70# pitt mix can certainly pull she is way too strong for us. This harness allows her to be restrained and walked and tethered in our vehicle without being hurt or experiencing rub. It’s strong, well made, well padded, comfortable and the optional loop on the front curtails her ability to flex her might. The harness also prevents her from “backing out” of the harness. Would not ever consider a different harness for her. We went through at least 10 different makes of harnesses and restraints before we found this one. It’s a blessing! It’s perfect and worth every penny! Posted On 10/17/17 by Gina B from St Louis, MO Yes, Gina B recommends this product! I've been looking for a no-pull harness for a while, but haven't been able to find one to fit properly. This one fits well with multiple adjustment areas. It works great and we love it! Posted On 08/22/17 by nancy b from woonsocket, RI Yes, nancy b recommends this product! this is by far the best harness i have ever got for raven,dobermans are deep chested so it is hard to find good fitting anything,it fits her well and she looks so good in it.love it. Posted On 08/07/17 by George R from , CA Yes, George R recommends this product! I have a 4-month old, 10lb Aussie Shepherd/Papillion mix that would pull like crazy everytime I walked him. Nothing would work to get him to calm down. And I have a bum right knee, so my knee would be killing me after every walk. Finally a Harness That Works!! Bought this harness and it's like night and day. He tries to pull, but realizes how futile it is and there's no more stress on my knee. He'll then throw a fit by lying down, but that's a losing battle as well. Finally I can walk him without it looking like my dog is on heroin. Posted On 05/15/16 by Carolyn R from New York, NY Yes, Carolyn R recommends this product! Had to send back the medium for a large. Unfortunately my pup falls in between sizes at 50 lbs the medium is too small and the large is still just a little too big on the smallest setting. She is very tall and thin so maybe a boxier breed this will fit well on. But overall it seems like it is comfortable for her and does feel more controllable for a dog who tends to pull. Posted On 02/14/16 by Leah P from Green Bay, WI Yes, Leah P recommends this product! This is awesome! Highly recommend for larger breeds! Meeko luvs it! Thank you! Posted On 11/16/15 by Adrian P from Chattanooga, TN Yes, Adrian P recommends this product! My Pitt mix girl has no filters and that includes pulling. We've tried many harnesses to walk her and the best one to lessen her control is a harness with a front ring. She is 70 pounds of sheer muscle and determination. This harness fits well, does not cut her under her front legs, is strong, and looks good. I'm not worried she will get loose or break the harness. It adjust easily and the adjustments hold in place. Great product! Thank you! I can quit looking for a harness that works, this is it! Posted On 07/31/15 by Nicole K from , Yes, Nicole K recommends this product! Posted On 06/19/15 by Debbie B from Australia, Yes, Debbie B recommends this product! I just received this harness and it is easily the best harness I have purchased for my Dobermann. After having bought several different types over the years they were either complicated to work out and buckle up, or were not durable, or did not appear secure enough. Until I discovered Baxterboo and bought this harness that doubles as a seat belt and is so easy, just slip over the head and buckle up the sides, not to mention the protective front for a broad chested Dobie, and excellent quality. This is an awesome product!